This is a really lovely chicken story book for the Littlies, with an underlying message about overcoming or coping with fears. I'm a sucker for book art, and this one certainly captivated me! Delightful illustrations of chickens in all sorts of bother, supporting a story that is sure to please the young amongst us. Very cute book. 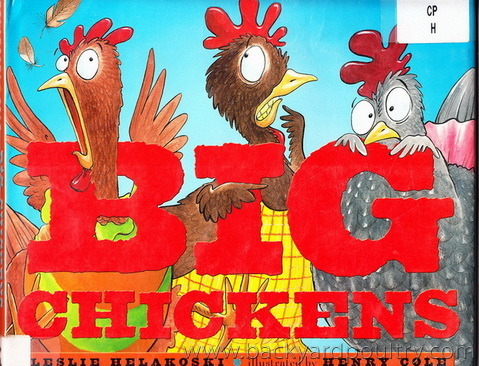 The author uses catchy phrases as she tells the story of 4 chickens who learned they were very big chickens indeed! The chickens flee the henhouse when they see a wolf. The book follows their adventures as they stumble into one mess after another (each mess caused by their own fear). In the end, they conquer their fears and become big chickens! My kids in story time love this book. An absolute read aloud favorite at our house. The excitable chickens are great fun to give voice to as they get themselves into and out of a whole host of predicaments. The chickens in this book are "big chickens" who run away to hide when the wolf comes calling...along the way, they find lots of things to be scared of until they realize they are BIG chickens and don't have to be scared! Great book for calming fears. BIG CHICKENS is simply fun and silly. This story, about four lovable chickens acting like "big chickens," is full of repetition, assonance, consonance, action words, and word play. The bright, bold illustrations also contribute to the fun. It is a great read-aloud book that I am sure kids will enjoy over again. Thanks Helen. I can see a few good reasons that I should buy this one. Great. Let us know of any feedback if you do get it C07.